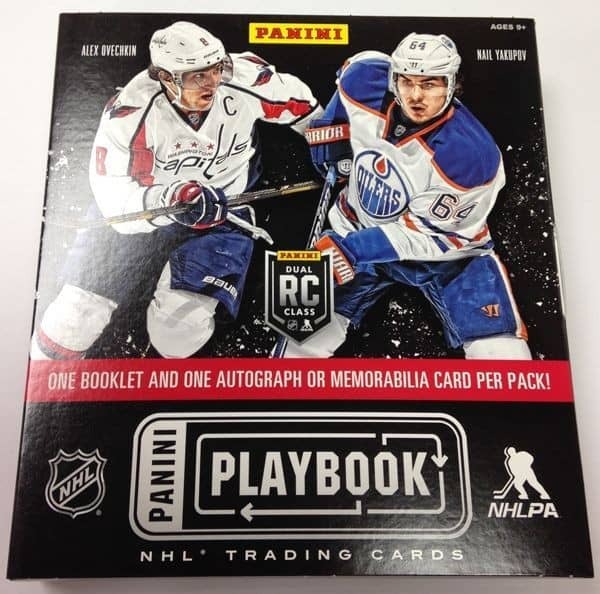 Produktinformationen "2013/14 Panini Playbook Hockey Hobby Box NHL"
Playbook makes its debut for the NHL!! Look for Rookie Autograph Jersey Booklet cards #'d/199, 25, and 5! Split Decisions Booklet cards feature the league's best netminders along with oversized memorabilia pieces. Double Rookie Classbooks pair up the best rookies of the 2013-14 Dual Rookie Class! Double Rookie Classbook: The Double Rookie Classbook pairs up the best of the 2013-14 NHL Dual-Rookie Class. Find Jersey, Prime and Patch variations. Signature Booklet: Find Signature Booklet cards with autographs and memorabilia of the league's top players! First Drafts Signatures: Every pack contains an additional autograph or memorabilia card, including First Drafts Signatures that features players on Draft Day. Split Decisions: Split Decisions booklets showcase oversized memorabilia with the league's most agile netminders. Base Cards: Base set includes 100 cards along with, Gold (#'d /50), Holo Silver (#'d/25), and Purple (1 of 1) parallels. 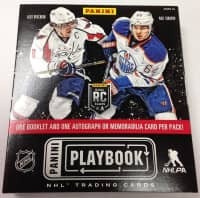 Weiterführende Links zu "2013/14 Panini Playbook Hockey Hobby Box NHL"
Fanbewertungen für "2013/14 Panini Playbook Hockey Hobby Box NHL"
Hatte das Glück 2 Playbooks in einem Pack zu erhalten plus 1 on-card-auto plus Base-Card! Top Produkt wie ich finde!